1600 PSI Electric Pressure Washer is rated 4.8 out of 5 by 1556. Rated 5 out of 5 by Harry30 from Pleasantly Surprised I did not have experience with electric pressure washers prior to this purchase so wasn't sure what to expect. For the price I wasn't expecting much, but this thing really surprised me. Obviously, this won't push as much water as the larger gas powered units, but it is perfect for small/medium jobs around the house. Was able to completely clean the decking and coping around my pool in a little over an hour. I especially like that it is compact and portable. Easy to move around to tight/odd spaces and takes up minimal room in storage. Bottom line - for someone looking to do occasional power washing jobs around the house, this is a great buy. Rated 5 out of 5 by cdelectric from Perfect for everyday This is now my second pressure washer, the first failed after a few years, luckily the extended protection plan I purchased at my local HD store came through. So I purchased a second pressure washer. Same make and model, the new model has some slight changes from the first but they are improvements. 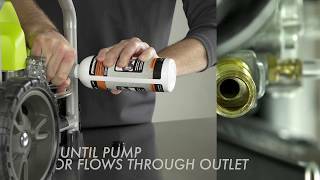 This is perfect for washing down your side walk, floors or walls and washing your cars (just make sure to use the correct nozzle). I have used soap container and this comes in handy when apply floor cleaner or de-greaser. Then just switch nozzles and your ready to wash down driveway. You cant go wrong with this, priced well and works well. Rated 5 out of 5 by DeeEyeWire from Great little addition to my toolset I debated whether or not to save a few dollars and buy the blue Harbor freight model, and I'm so glad I bought the Ryobi instead. The feed hose an extension cord are plenty long enough for my true story 2800 square-foot home. The power is More than adequate to do any small jobs and most medium to medium large jobs provided you don't need ridiculous power like to strip paint off your metal utility shed. Be sure you have adequate water pressure going to the unit and that you're plugging it in a dedicated outlet as to not trip a breaker or brown out the power washer. Comes with three attachments to do jobs from washing your car to blasting mold off white vinyl siding. Rated 5 out of 5 by Anonymous from Small, Light, Quite, Strong. !00% Perfect. 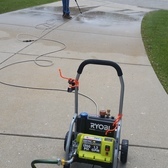 Ryobi 1600 PSI 1.2-GPM Electric Pressure Washer. It Took 5 Min To Put It Together, Hook It Up & Start Using It. I Didn't Want To Use Any Chemicals, Cleaners Or Soap. Just The Unit Itself. Nice And Small, Super Light Weight, Very Quite & Really Strong. In 3.5Hrs. I Did 16 X 16 Deck With The Deck Fencing & Steps!! Next The Rest Of The House. If It Holds Up 100% Perfect Ryobi. Great Price For What You Get. Rated 3 out of 5 by sticker500 from Not a bad machine but support is not good I purchased this unit and then it quit working. The GFCI plug on the end shorted out. I contacted Ryobi who explained it needed to be taken to an outdoor service center. The nearest one is 30 miles away. I went to Home Depot and purchased another one for 17.00 which saved me time and fuel. Ryobi should have just sent a refurbished unit and handled this professionally. If I had taken it to service it would have taken 3 weeks to repair. The GFCI had water inside the plug which makes no sense. Rated 5 out of 5 by randy45100 from work horse! I bought this for spraying moss off the side of a house. I bought for price,lightweight, and size for easy storage. I had no idea how impressed I would be by this product. I ran it for 5 hours straight and it never skipped a beat and did everything it was supposed to. Very powerful for a small unit and quiet. It made quick work of the dried on moss and made the house look brand new again. Would highly recommend for anybody looking for a budget washer with a big punch! Rated 4 out of 5 by grumpyglenn from good household tool I bought this little unit after receiving a HOA letter complaining about green mold on my house. Gutter has small leak that needed repair. BFD. Since it was cheaper to clean off the mold than fight the HOA I purchased this unit from HD. Worked great. Since I had it out and hooked up, decided to give the front sidewalk a hit too. I would never have suspected to get such good results from such a small unit. The sidewalk looks new. I'm quite happy with it. The only things I'd change? I'd have it come with a longer spray hose, and maybe a wider tip, say one that would clean caked on grime in a 6" swath. really good little washer. Rated 5 out of 5 by bobaltig from Good Products I bought this pressure washer to clean my pickup truck and my travel trailer. I really enjoy having the soap dispenser. Using a good wash 'n wax products with the soap dispenser makes cleaning and protecting the painted aluminum surfaces on the travel trailer a breeze. Reaching those hard to reach spaces on the pickup truck, such as the wheel wells is very easy now. I've had extensive back surgery and have limited mobility. This pressure washer has been a gift from God. Without it I would have to pay someone to do the above routine maintenance tasks. Thank you Ryobi for providing quality tools at affordable pricing. The RYOBI 1600-PSI Pressure Washer is compact and lightweight, making it easy to move to various locations around the house and job site. With a powerful 13-Amp Electric Motor, this RYOBI Pressure Washer delivers 1600-PSI of force for quick cleaning of driveways, decks, windows, and patio furniture. Featuring a durable and compact roll-cage frame design, this pressure washer is designed for easy transport. The on-board detergent tank offers hassle-free cleaning by eliminating the need to drag a bucket and hose behind you. The RYOBI 1600-PSI Pressure Washer is equipped with on-board accessory storage for added convenience and a bonus Turbo Nozzle for up to 50% more cleaning power. The RYOBI 1600-PSI Electric Pressure Washer is backed with the RYOBI 3-year limited warranty and is guaranteed to deliver results for years to come.